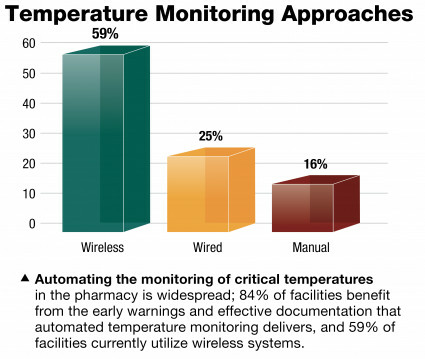 For accurate, reliable monitoring of medication storage temperatures, automated systems deliver a solid return on investment. Once monitoring is automated, the risk of product loss is immediately reduced as staff is alerted to trends before they become problems, the chain of command for responding to alerts is clear, and demonstrating control to various regulatory inspectors is simplified. This well-rated technology is supplied by an array of vendors, making it easy to find a product to suit specific needs.